How to Apply for CSIR UGC NET June 2019, Joint CSIR UGC NET June 2019 Online Registration Begins at csirhrdg.res.in, Apply Before 15th October. Joint CSIR-UGC NET June 2019 Online Registration has begun on the official website of Council of Scientific & Industrial Research - csirhrdg.res.in. CSIR is tentatively scheduled to conduct the National Eligibility Test on 16th June 2019, for Junior Research Fellowship and Eligibility for Lectureship for subjects that come under the faculty of Science & Technology including Chemical Sciences, Life Sciences, Mathematical Sciences, Physical Sciences, and Earth, Atmospheric, Ocean and Planetary Sciences. CSIR UGC NET is likely to be held on June 16, 2019. Council of Scientific and Industrial Research (CSIR) will conduct the second edition of the NET 2019 for science subjects in June and has announced the tentative date for it. So far, the Council has released the detailed information bulletin of the exam giving details of the exam, syllabus, eligibility, date, fees, etc. Online registration for the exam will begin on September 25. Interested candidates can apply till October 15 at csirhrdg.res.in. CSIR, on behalf of UGC, conducts the National Eligibility Test (NET) for the award of Junior Research Fellowships (JRF) and for determining eligibility for appointment of Lecturers in Chemical Sciences, Earth/ Atmospheric/ Ocean/ Planetary Sciences, Life Sciences, Mathematical Sciences and Physical Sciences. Candidates with M.Sc. or Integrated BS-MS/ BS-4 years/ BE/ BTech/ BPharma/ MBBS can take the exam. Candidates possessing only Bachelor's degree are eligible to apply only for JRF and not for Lectureship LS. Graduates will be eligible for CSIR fellowship only after getting registered/ enrolled for PhD/ Integrated PhD program within the validity period of two years. While the maximum age limit for JRF (NET) is 28 years, there is no upper age limit for Lectureship. The question paper will comprise of three sections: the first part will assess the general aptitude of the candidates while subject related MCQs will be asked in the second part. The third part will assess the scientific pursuit of the candidates. 'The questions shall be of analytical nature where a candidate is expected to apply the scientific knowledge to arrive at the solution to the given scientific problem,' reads the notice. Meanwhile, CSIR June NET 2019 results are pending. For the June edition exam of 2017, CSIR had declared the result in June. Candidates interested in applying for the same must apply online on or before 15-10-2019. As per the official notification, the fellowship to successful candidates will be effective from 1st January, 2019 with the validity period of 2 years for joining the fellowship under CSIR Scheme. The interested candidates can apply online directly through the official website, csirhrdg.res.in. The online application process for the Council of Scientific and Industrial Research (CSIR) UGC NET examination to be conducted on June 16 will begin on February 25, 2019 on the official website, csirhrdg.res.in. The interested candidates can apply directly through the official website before March 22, 2019. CSIR UGC NET 2019: Registration closes on March 22 @csirhrdg.res.in: The Council for Scientific and Industrial Research (CSIR) closes online application for Joint CSIR-UGC National Eligibility Test (NET) on March 22, 2019. The candidates, who are interested and have not filled up form yet, are advised to register online on the official website of CSIR- csirhrdg.res.in . The candidates who qualify CSIR-UGC NET would be eligible to be appointed as a lecturer in the fields of Chemical Sciences, Earth, Atmospheric, Ocean and Planetary Sciences, Life Sciences, Mathematical Sciences, Physical Sciences. The application fee for general candidate is Rs 1000, for OBC (Non-Creamy Layer) candidate is Rs 500, and Rs 250 for SC/ST/PwD. Other Backward Class (OBC) candidate whose caste is not listed in the Central List and/or who do not belong to OBC (Non-Creamy Layer), though his/her caste is listed in the central list, shall apply as ‘General’ candidate and is required to pay Examination fee Rs 1000. The paper will consist of multiple choice questions (MCQ) based on the subjects of life science, Earth science, Mathematical science, Chemical science, and Physical science. The Candidate should hold an MSc or equivalent degree/ Integrated BS-MS/BS-4 years/BE/BTech/BPharma/MBBS with at least 55 per cent marks. While for reserved category, it is 50 per cent. Apart from this, the candidate holding BSc (Hons) or equivalent degree or students enrolled in Integrated MS-PhD program with at least 55 per cent marks can apply too. The candidates can apply online directly through the official website, csirhrdg.res.in. UGC NET: The UGC NET is an examination which is conducted to test the eligibility of the aspirants for the award of Junior Research Fellowships (JRF) NET. Also, UGC NET determines the eligibility for appointment of Lecturers (NET) in certain subject areas. Part A will cover questions based on General Aptitude including Logical Reasoning, Graphical Analysis, Analytical and Numerical Ability, Quantitative Comparison, Series Formation, etc. Part B will comprise of Subject-specific questions for which the candidate has applied for JRF or LS. The Single MCQ Based Test will carry 200 marks and candidates will be given 3 hours to attempt the same. Negative marking is applicable. The test will be conducted at 27 exam centres across the country in two sessions viz Morning Session from 9AM to 12Noon and Afternoon Session from 2PM to 5PM. Candidates need to pay an online application fee of ₹1000 for General Category, ₹250 for SC/ST/PwD and ₹500 for OBC (non-creamy layer). 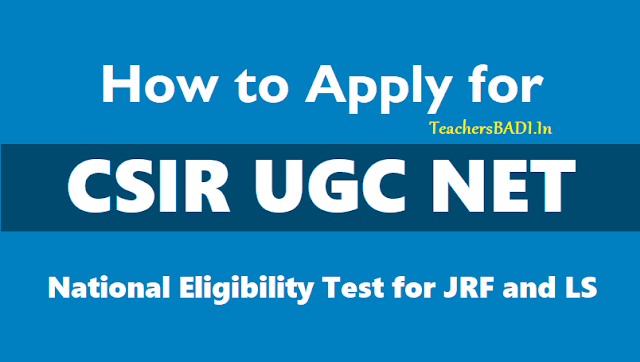 How to apply for Joint CSIR-UGC NET June 2019? Interested candidates can apply online on or before 22 March 2019 on the official website of Joint CSIR-UGC NET - http://csirhrdg.res.in/ and must take a printout of the duly filled application form for further reference. Before applying Online, candidates are advised to go through the detailed notification available at CSIR, HRDG website CAREFULLY. Candidates must write their name, father/mother's name as written in their Matriculation Certificate (X Class Board) and should ensure that the same are matching with their educational qualification certificates and caste certificate except for married females. Successful married female candidates are required to send scanned copy of their marriage certificates alongwith any other documents as proof as may be required by CSIR-HRDG, through e-mail to : mailnetquery@gmail.com. All Caste/PwD Certificates shall be strictly as per Govt. of India instructions. The validity of OBC certificates (Non-creamy layer) shall be governed as per Govt. of India instructions. After filling the online application, candidates should preview their entire application form and make changes if required before final submission of online application. No change in the particulars entered in the application form will be possible after final submission of online application and no correspondence in this regard will be entertained. In the event of qualifying the JRF/LS NET exam, certificate will be issued strictly on the basis of information provided by the candidate in his/her online application form. After successful submission of ONLINE Application, an Application Number will be auto-generated. The candidates are advised to preserve the Application Number for future reference and for downloading his/her e-Admit Card. The candidate should also keep a print (hard copy) of the duly filled-in application form for future use. The candidate is also advised to note down his/her e-mail ID and Password for future reference.